Chief Justice Bivins noted that economic conditions often require both spouses to work; particularly in military families, yet that can be very difficult when military service requires a family to move to a new location every two to three years. He underscored the Court’s desire to assist and support Tennessee’s military spouses and their individual families as well as our men and women in uniform. Justice Connie Clark gave an overview of the history and impact of the Military Spouse Rule change noting that not only did the Court receive comments from several Bar organizations, but also from more than 100 Tennessee attorneys who are military veterans. Commenters provided factual information to support the change including the fact that 79 percent have moved across state lines in the preceding five years making it nearly impossible for attorney spouses-95 percent of whom are women-to fulfill individual state requirements for reciprocity or comity admission. “This inability to obtain admission in the new state results in a potential income loss of $33,745 per year,” said Justice Clark. Under the revised Military Spouse Rule, attorney spouses are not required to take the Bar exam again if they previously passed the exam in another state. The attorney spouses may be admitted as long as they are licensed in another state and meet Tennessee’s appropriate ethical requirements. Justice Holly Kirby recognized the four new admittees including Joanna Brake Ragon, her Supreme Court law clerk. The other three admittees are Tessa Allen Linde, Maria Stephanie Quimson Campbell, and Joseph Michael Kendrick. 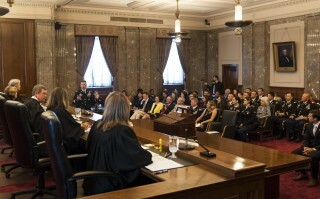 Chief Justice Jeff Bivins recognized several individuals who were instrumental in the process, including Josie Beets, President, Military Spouse JD Network, Judge George Paine, Jack Turner, of Jack B. Turner & Associates, Willy Stern, Chair of the Legion Fund Advisory Board, and Martha Boyd, Shareholder at Baker Donelson Bearman, Caldwell & Berkowitz, PC. 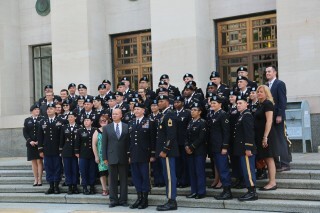 During the recognition event, Judge Paine, on behalf of the Legion Fund, and to show the gratitude of the 5th Special Services Group at Ft. Campbell, presented each justice with a gladius, a gift reserved for members of the Green Beret upon retirement. Learn more about Tennessee’s Military Spouse Rule, Supreme Court Rule 7. 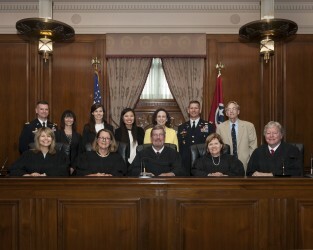 The TN Supreme Court Justices, along with new admittees, admitted through Revised Rule 7, Josie Beets, President, Military Spouse JD Network, Brigadier General Todd Royar, Deputy Commanding General of the 101st Airborne Division, and Judge George Paine. 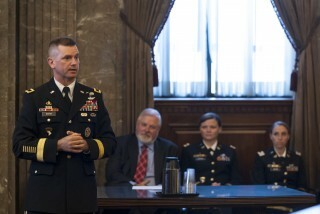 Brigadier General Todd Royar, Deputy Commanding General of the 101st Airborne Division, thanks the Supreme Court for their support of military and their families. Judge George Paine presents each member of the TN Supreme Court with a gladius, a gift normally reserved only for retiring members of the Green Beret.